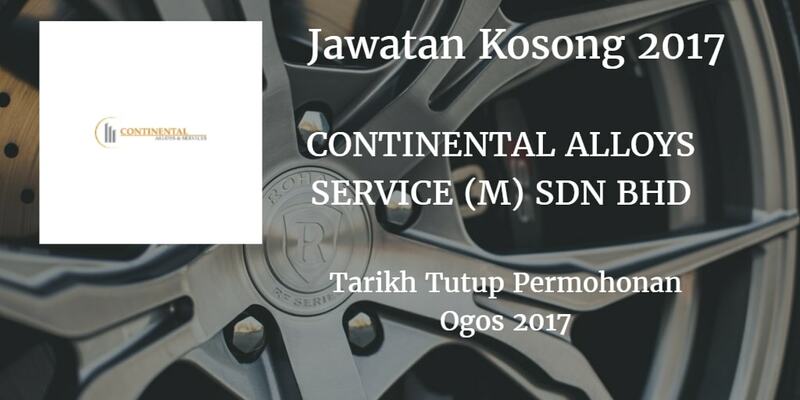 CONTINENTAL ALLOYS & SERVICES (MALAYSIA) SDN BHD Warganegara Malaysia yang berminat bekerja di CONTINENTAL ALLOYS & SERVICES (MALAYSIA) SDN BHDdan berkelayakan dipelawa untuk memohon sekarang juga. production quality and safety standards are complied with. outlined on blueprints in an Oilfield Job Shop environment. Performs inspection procedures to verify work using precision measuring instruments. Maintains a safe and healthy work environment by following standard operating procedures. To support production to achieve target in terms of quality and quantity. Able to work independently and possess good problem solving skill. Performs ancillary duties as required. At least 5 years CNC Machinist experience. possess good attitude and self-discipline. Plo 39. JalanPersiaranTeknologi. Taman Teknologi Johor.